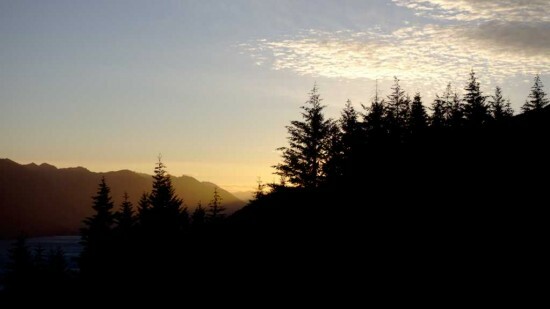 Despite the incredibly strong winds at the end of chapter 3, when we got up the next morning it was quite still. After we packed up, our first stop was in town at a very nice bakery that we had been to the previous day; they had really yummy cream cakes. Apparently I have a sweet tooth, or at least that’s what other people say. Our plan was to ride to Queenstown over another Big Hill near Cardrona. 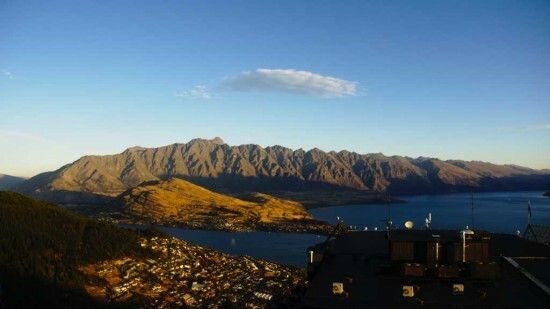 Then we had planned to spend a day in Queenstown. While we were sheltering from the wind in Wanaka we had found out some information about a cruise at Doubtful Sound, which departed from Queenstown, so that was what we had planned for our rest day. After Queenstown we were planning to ride to Clyde and the start of the Central Otago rail trail, which we were looking forward to. 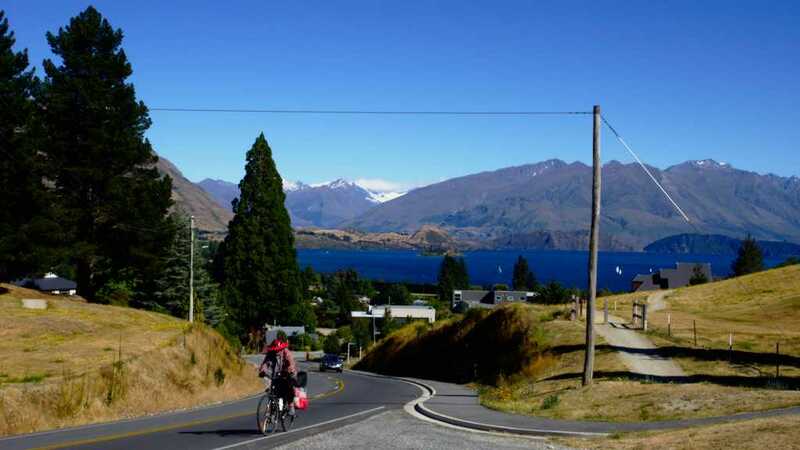 It was, however, 90 km from Queenstown to Cyde, and even though Dad kept saying “it’s all downhill except for the uphill out of Queenstown” Mum and Vera were a little concerned about that day. 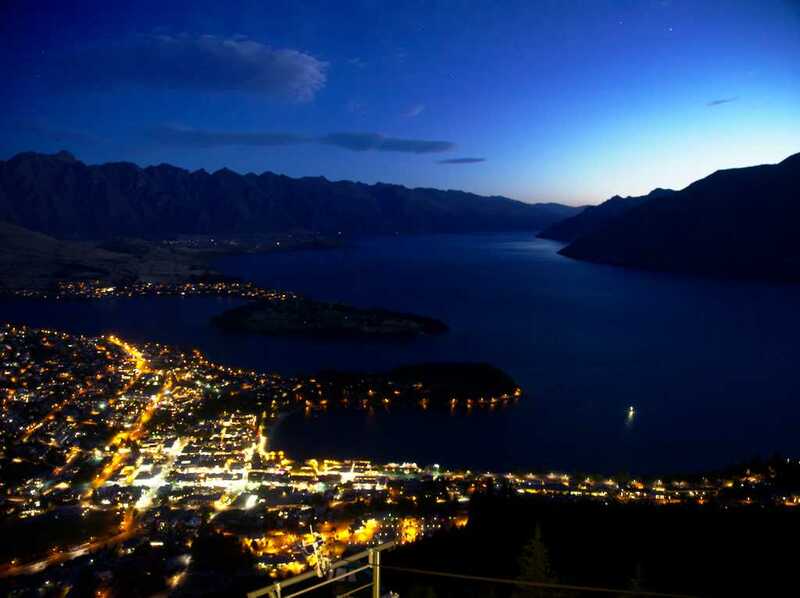 Queenstown. I cropped out most of the motorhomes. This is really just the water intake; the power station is a couple of hundred meters underground. 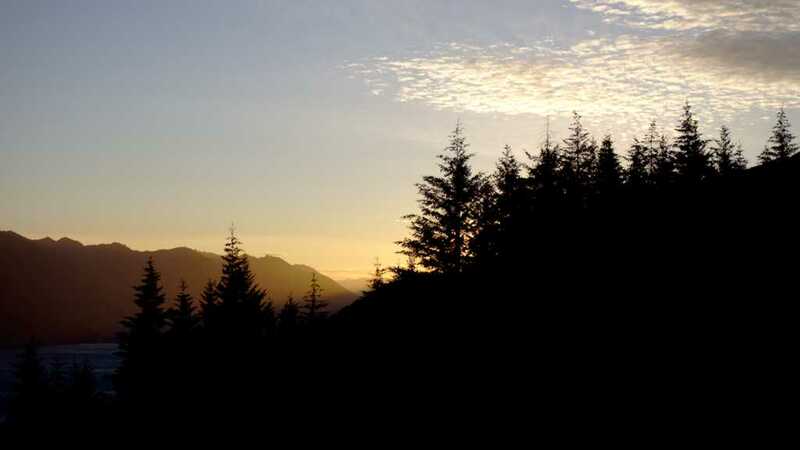 The flat U shape is typical of valleys carved by glaciers. 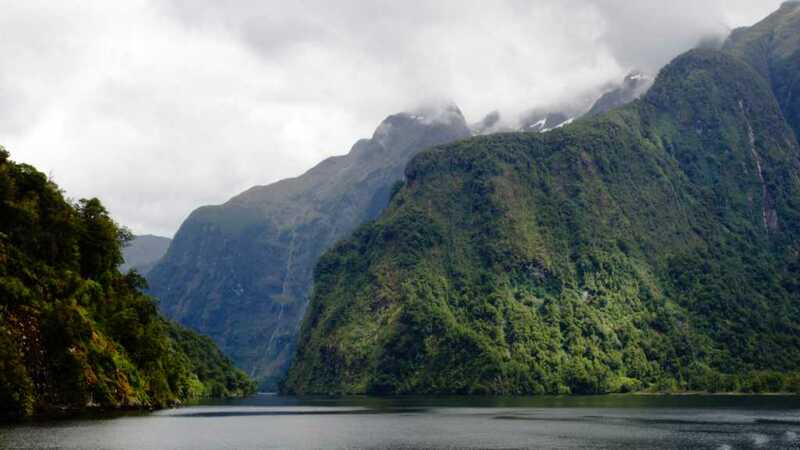 The fjord would have the same profile, except the bottom bit is underwater. The gap is Wilmot Pass. What can I say? Why get a garbage truck to drive up to the top when you can send the garbage down to the bottom? 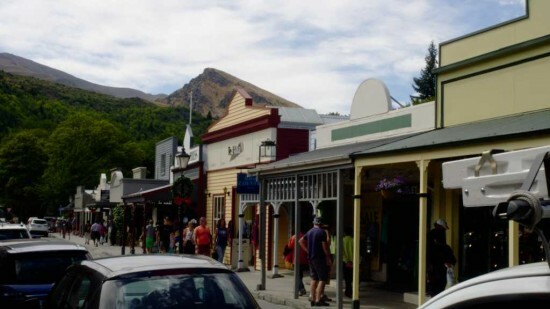 Arrowtown reminded me a lot of Maldon, but with perhaps more people. 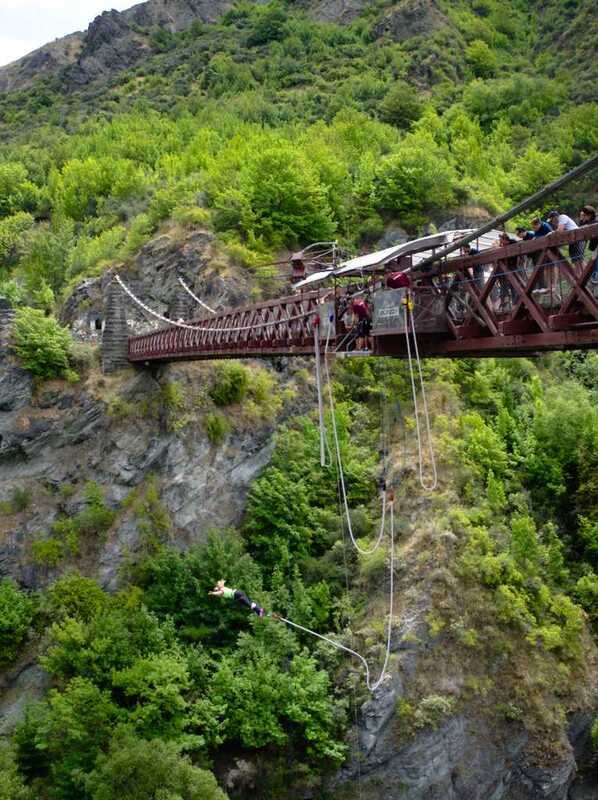 People have been jumping off the old bridge for quite a long time. Anyway, it was lovely riding heading out of Wanaka to Cardrona. There was one climb to get out of town and after that the road went along a valley, which was mostly flat. We didn’t have a headwind either, which was very helpful; some of the cyclists that we had met at Makarora were heading in the opposite direction and they were sick and tired of cycling into our tailwind. We felt sympathy for them, but didn’t really want the wind to change direction just yet. Cardrona has an interesting old school pub, which looks just about gold rush era (US translation: wild west). Although the actual air temperature was not that hot, the sun was really strong which we had noticed throughout the trip. So we had decided to stop for morning tea. Vera had gotten a bit ahead of us and was already settled down in the bar with a pint of beer. 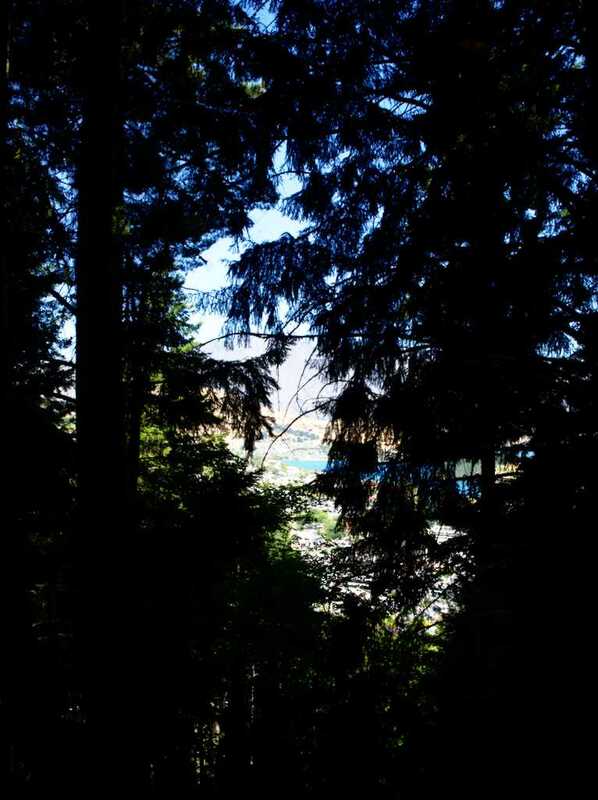 My parents and me were more conscious of the mountain pass that we had to climb over, so we skipped the alcohol (it really doesn’t help) and had coffee, and yummy cheese scones. It was here that Dad had a fall, and dislocated his shoulder because he fell on it the wrong way. The hotel staff were really helpful; in the end we decided to call an ambulance because the paramedics are much better when it comes to fixing a dislocated shoulder. 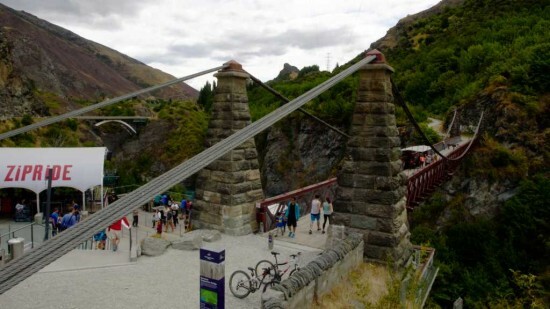 Unfortunately, this all put an end to our plans to cycle over the pass to Queenstown. 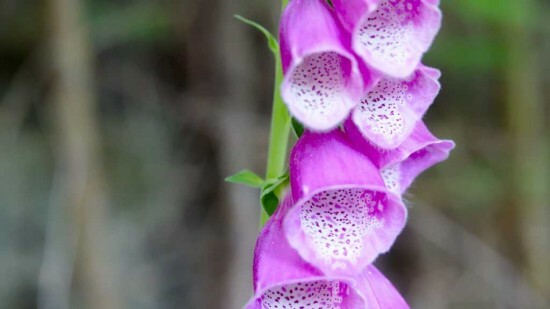 The ambulance took Dad to the hospital at Queenstown for a doctor to look at his shoulder, and Mum went with them. That left Vera and myself, and four heavy bikes. We called for a taxi which took us to Queenstown, where we were already booked in at a caravan park. 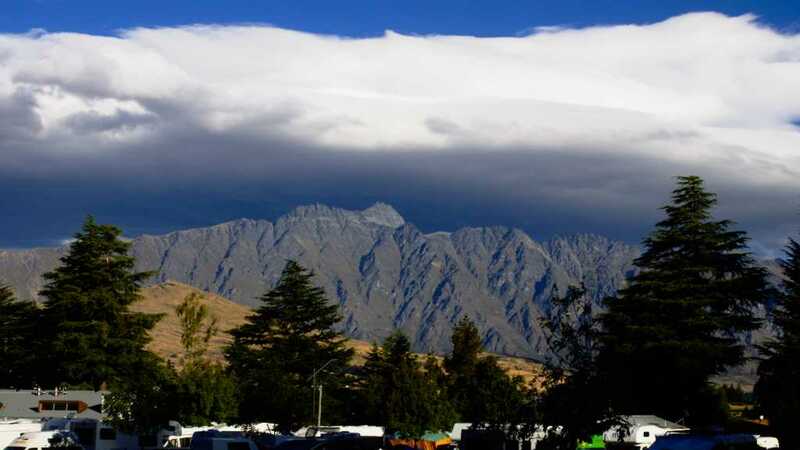 When we got to Queenstown we found that we had been given a lousy site sandwiched between the sheer white sides of two humongous motorhomes, and there was absolutely no shade (except for a bit from the motorhomes perhaps). We explored a bit, and found a much nicer spot near the edge of the caravan park, with some trees providing a nice area of shade, so we went down to the office and they were kind enough to rebook us on that site. We were also waiting to hear from my parents as to what the doctor said, and whether Dad would be able to continue cycling for the rest of the trip. So we started unpacking, and I ate quite a bit of the stash of apricots that I had collected off a tree in Wanaka. Eventually my parents came up to the caravan park and we learned that Dad had to speak to a pysio, but he was able to go on the Doubtful Sound tour with his arm in a sling. They were going to stay at a hotel because camping would be difficult with his injury. After we had set up our tents and my parents had found a hotel, we all went out for dinner at a nice Indian restaurant in town (it was quite late to go out shopping and cook our own food by that stage). 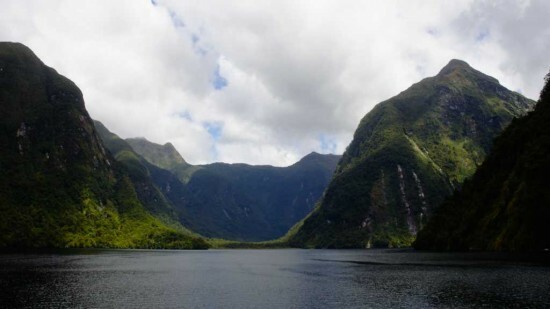 The next day was the much anticipated trip to Doubtful sound, a fjord on the West coast. Milford sound is far better known, but I suspect Doubtful sound is more worth going to: Milford has a largish town and lots of people, meaning that you wouldn’t see as much of the wilderness, and Doubtful is also a substantially larger fjord, with quite a few side inlets that we got to see on the cruise. 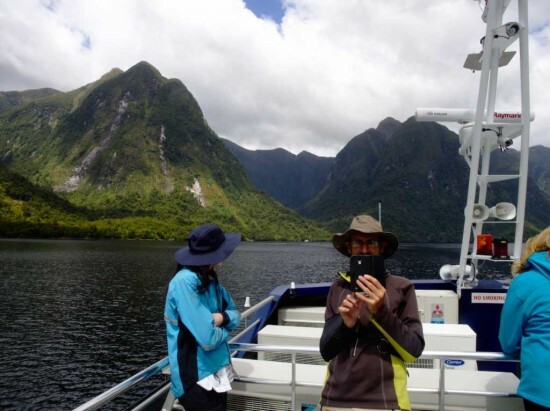 The tour itself was quite a long day: We went by bus from Queenstown to Manapouri, then a boat across the lake to the hydro station, then another bus over Wilmot Pass, and then another boat out on the Doubtful sound itself. And then in reverse to get back to Queenstown. As I mentioned, there was a hydro station on the far side of Lake Manapouri, which is in fact the largest hydro plant in New Zealand. 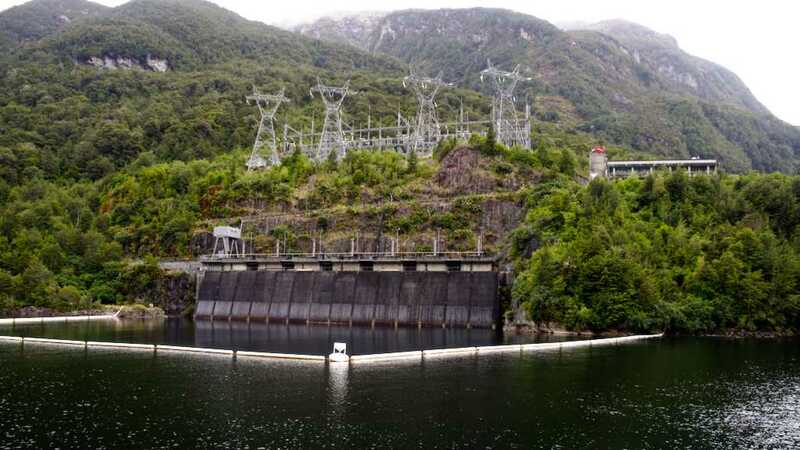 The turbines and generators are actually located 200 meters underground, pretty much directly beneath the western end of the lake; and the tailrace goes out to Deep Cove at the head of Doubtful sound. 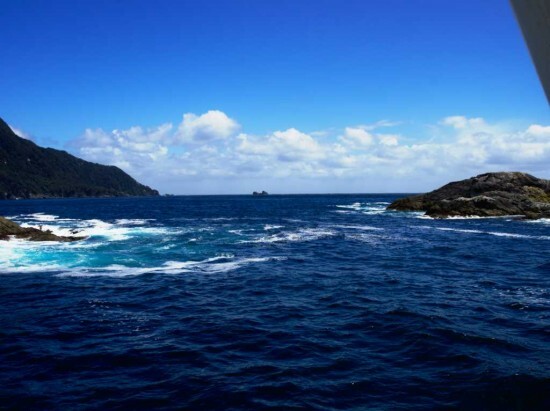 Most of the electricity generated by the power station is used by an aluminium smelter. 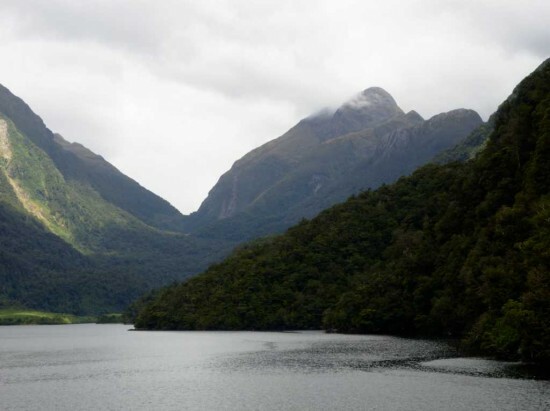 The project is also well known for giving rise to the conservation movement in New Zealand: When the power station was first proposed in the 1960’s, it involved building dams to raise the water level of the lake, sparking protests. In the end the dams were not built. It is apparently possible to go on a tour through the power station itself, which would have been fascinating, but unfortunately our group did not have enough time to do it, so we got onto buses to go over Wilmot Pass. We sat down, and what do you think I should see? Sandflies!!! 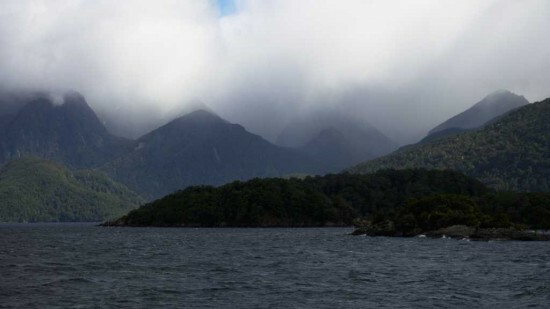 We hadn’t seen any since Haast Pass basically, but now we had returned to their domain. And they had gotten into the bus with us. Back at the caravan park in Queenstown I had met some people from Scotland who related how the sandflies got into their car with them, and while they were driving they would feel their ankles getting bitten. It struck me that cycling has something of an advantage in that you don’t get bitten while you’re moving; the sandflies can’t fly very fast. Anyway, by the time we got to Deep Cove a massacre had taken place and there was a small pile of sandfly bodies next to the window where I was sitting. 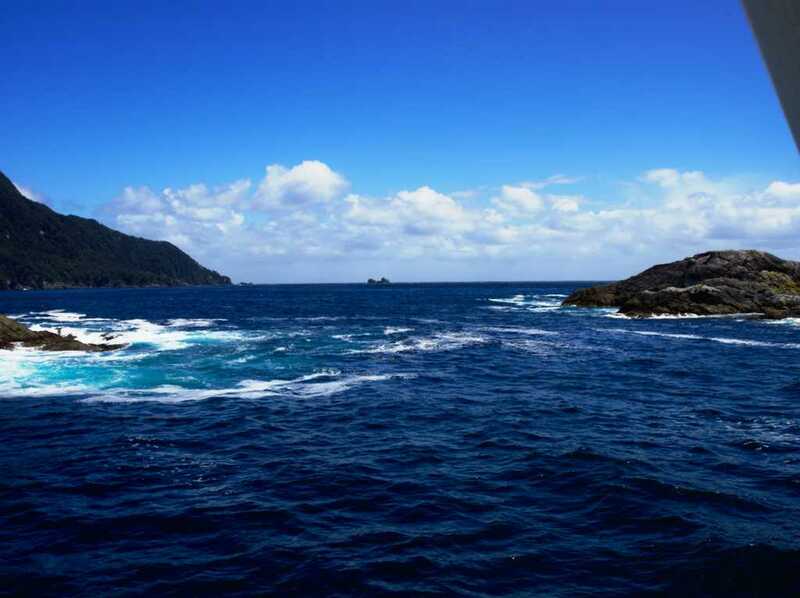 The cruise was very good, you can see the scenery from the photos. The next day (it was a Monday) we also spent in Queenstown, because Dad had to see the physio who wasn’t open on weekends. At this point Vera announced that she wasn’t going to keep going with the trip; she had found out that there were flights from Queenstown to Brisbane. She made an excuse to do with here son who lived in Brisbane, who was having a hard time. So while Vera organised packing her things, my parents and I explored Queenstown, since the physio wasn’t until midday. We also decided to take the gondola (enclosed chairlift type of thing) up to the Skyline restaurant after tea to see the sunset. After looking at the view and taking photos, we went to the cafe. 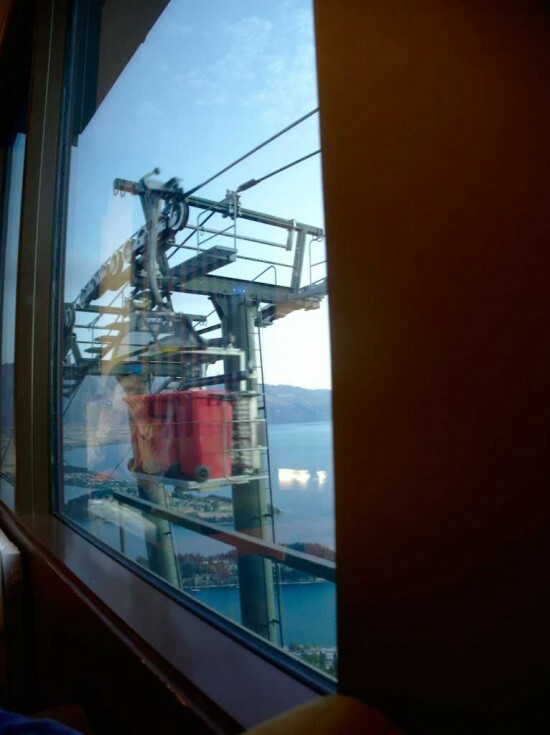 We were sitting at a window next to where the gondolas went past every few seconds, and then out of the corner of my eye I saw a bundle of wheelie bins cruise past the window on a rather industrial looking gondola. When you think about it, it’s quite a sensible way to take out the rubbish really. The physio had been very understanding of Dad’s situation, not wanting to abandon a long term cycling trip. He suggested some exercises, and said to do a short test ride and if that went ok, try short distances with panniers and see how things go. Dad had found that he could ride ok, so we decided to continue on the next day. 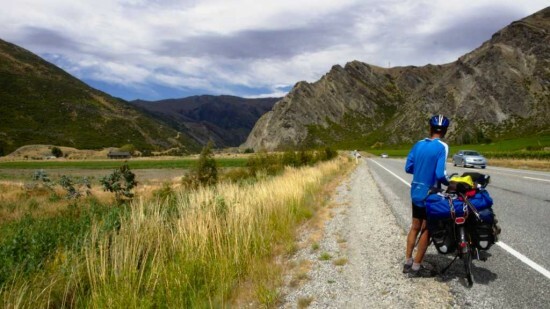 Doing the full 90 km to Clyde was out of the question; we figured we would ride to Arrowtown, 20 km away, and if that went ok continue on to Cromwell which was a further 40 or 50 and easy riding. 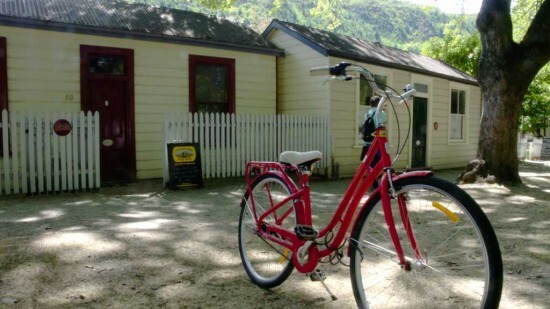 Arrowtown was an interesting place. It was a lot like Maldon or perhaps Sovereign Hill; old style shop fronts along the street (Maldon has much wider streets though). There were a lot more people though. After having a picnic lunch in the park and having a good look around the town, we kept going (the riding wasn’t affecting Dad’s shoulder). Riding to Cromwell certainly wasn’t “all down hill”, but it was easy because we had a gale of a tailwind. The road followed the Kawarau river which flows out of Lake Wakatipu (the big lake at Queenstown). The whole area was quite dry and barren, but as it turns out the brown hill sides are not just rock, they are actually covered in small bushes (native vegetation) which give it the brown colour. We did notice how dry it was when we put up our tents though: it was hard ground to bang our pegs into. I am particularly pleased with my current tent in such situations, because it only needs 3 pegs to put it up (4 more if I want to put out all the ropes in windy conditions). In the past I have owned tents that have been a real pile driving operation on hard ground. End of chapter 4. In the next episode, we reach the much anticipated Otago Central Rail Trail and see lots of old and interesting belt driven machinery. We also found a Brooks saddle that might be older than Mum’s saddle (which she got second hand in 1982).